Mark your calendars for January 8th we're taking workplace safety to the next dimension. New to Twitter? No problem. Click here for instructions on signing up. Join us for the launch of our monthly Twitter Chat. Peter Cooke, Safety Specialist with Columbus McKinnon will be our guest safety expert. In addition to traveling the world teaching proper rigging techniques, rigging gear inspection, hoist and crane inspection and maintenance, Peter is well versed in Hazard Communications. Our first chat is about Hazard Communications because communication is the foundation of any and all safe work environments. 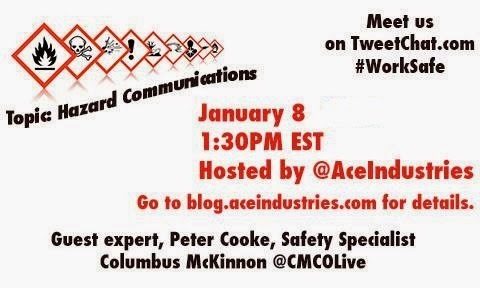 We'll be discussing Hazard Communications and the Hazard Communication's Checklist. OSHA regulations change and we want to start and continue the dialogue online to make sure that we're working together to keep manufacturing safe not just for the overhead crane and hoist industry but any industry regulated by OSHA. We'll keep the conversation going between chats using the same hashtag. Certified Crane Care Tech Tips is taking safety to the tweets!